The CFX is a portable dry herb conduction vaporizer made by Boundless Vapes. They also make the CF which is the smaller, less expensive version of the CFX. Both of these vaporizers aim for the popular portable vaporizers Crafty and Mighty but with a few differences and a lower price point. The CFX comes with a full temp spectrum via a 1.7” LCD display and on vape temp buttons. It offers quick heat uptimes and a large chamber for group sessions. So far I really like the performance, features and quality of the CFX, especially for the price. The CFX retails for $169 and you can click here to pick it up from my recommended authorized retailer. Full CFX Vaporizer Review below. The CFX vape is definitely not the smallest portable vaporizer on the market but it does feel nice in the hands and you can pocket it if need be. It is a bit smaller than the Mighty but even with the smaller size, I still feel like it’s much easier to carry this sized vape in a backpack, hoodie or purse. The flip side to the bigger units is that they do fit nicely in the hands and makes it easier to pass around in bigger group sessions. The CFX also does well in groups because of the large bowl, and ease of use. The exact dimensions of the CFX vaporizer are 5 inches tall by 2 ¾ inches wide and about 1 ¼ inches deep. The CFX weighs roughly 207 grams while the Mighty weighs 241 grams, so it is about 15% lighter as well as smaller. The oven on the CFX is also on the large size, and it can fit upwards of .5 grams but I tend to stick to about .15-.2 grams for the best results. The Boundless Vapes CFX comes with the CFX vape itself, DC charger (charges in 30-45 minutes) with USB charging cable (charges in 2-3 hours), the manual, a wax/concentrate pod, a cleaning brush and a packing tool. These are pretty much the standard accessories for most of the portable vaporizers available on the market. The CFX uses a ceramic heater with a ceramic chamber, a medical grade plastic vapor path and a full temp spectrum ranging from 100-430F (38-221C). One really nice feature of the CFX is the quick heat up time. The CFX will heat up to around 400F in about 20 seconds on average. This makes it one of the fastest heating conduction session vaporizers on the market. The vapor quality on the CFX is good overall, especially for the price. The vapor density is really good, this thing can kick out clouds. The vapor is fairly cool and smooth, and the flavor is above average. My only complaint in this department is that it might require a few burn-offs when brand new to get a fully neutral taste. My biggest complaint about my version of the CFX and the CF is the screen in the vapor path. (The latest version has a much improve screen that I plan to try out out ASAP) The older version stock screen tends to clog after a few uses and requires frequent cleaning to reduce draw resistance. Now overall the draw resistance is a bit higher than I would prefer but it’s not bad and I would compare it to something like the Arizer Air or Solo. But as soon as the screen gets gunked up, it’s pretty hard to get good consistent draws. The best part about this downside is the stock screen can be easily removed and replaced with something more free flowing. Basically the device works fine without modification but you can get even better performance with a bit less draw resistance and cleaning out of the unit with a simple screen change. The CFX temperature can easily be read and changed via up and down buttons located to the left of the the 1.7 OLED display. The buttons feel very nice and durable, there’s no delay from the button press to the screen display and it’s easy to read during the day. Unfortunately the screen is also bright at night so you’ll have to cover up the screen if you’re trying to be inconspicuous when it’s dark out. I prefer to start my sessions out around 360F and I’ll step up my session usually in 20 degree increments. So I’ll take some draws at 360, and then end it around 380, or 400. You’ll be able to tell the bowl is done when vapor density starts to get wispy and the herbs are a light to dark brown in depending on the temperature you finished at. Other than the screen the unit seems to be very reliable, durable, easy to maintain, and without software errors/delays/weird stuff. It’s very clean, simple and easy to use. The only downside is the stock screen. The brush that comes with the CFX is actually a very good tool to use after each session especially if the unit is still warm. Once the unit cools down, it’s going to much harder to brush out. Once you complete your session and the unit is cooling down, just twist off the mouthpiece, empty out the AVB/spent herbs and then brush off the screen. The herbs should just come right off. You can also use the brush to clean out the chamber. Basically if you stay on top of the stock screen and brush it out after sessions, you shouldn’t have any problems. But if you are out on the go, loading multiple chambers in a row without cleaning/brushing, that’s where the CFX can run into more draw resistance problems. 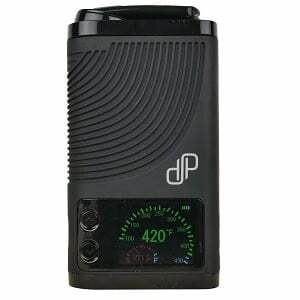 The CFX vaporizer uses two non-replaceable rechargeable 7.4v 2500mAh Li-Ion batteries. I’ve been averaging about 60 minutes of average continuous use on a full charge and the CFX can be charged in as little as 30 minutes if you are charging via DC (wall outlet). If you are charging via USB, the CFX will take about 2-3 hours to completely charge from dead. The CFX is at a very competitive price point and there are a couple different options if you aren’t quite sold on the CFX. I think the CFX probably has the most beautiful and easy to use display/temp spectrum at this price point but this unit might be a bit too big for some people. If you want a smaller unit you probably want the CF, which performs identical to the CFX but to shrink in size it loses fully adjustable temps and the screen, it also has a bit less battery life and a bit slower charge times. Overall in my opinion the CF is the best valued portable vaporizer since it only costs $110 and still performs great. The CF and CFX are the first two portable dry herb vaporizers from Boundless Vapes and they did a really good job. They seemed to be aimed at the Crafty and the Mighty and while they don’t completely reach the mark, they come pretty close for a lot less money. If you want the absolute best, I still have to say go with the Mighty for the reduced draw resistance, reduced cleaning/maintenance and superior overall vapor quality, but the CFX for $169 is less than half the price of the Mighty. For a unit that heats up in as little as 20 seconds, offers a full temp spectrum, and can effortlessly produce large consistent clouds at this price I am impressed. I recommend picking the up CFX from POTV. They are an authorized CFX retailer that offers great prices with fast/discrete shipping. If you have any questions about the CFX, CF or any other vaporizer, feel free to leave a comment below or hit me up on my contact page. Thanks for reading my CFX vaporizer review and have a great day! The CFX is packed full of great features at a very competitive price point. You get 20 second average heat up times, full temp spectrum and very good average battery life. The CFX isn't the easiest vape to pocket but you can make it work if needed. Click here to pick one up. Thanks for check out my CFX vaporizer review. the mouthpiece screen that you show on youtube is different that this one you reviewed here, what is the difference? there are new versions?? The one on Youtube is the updated screen with better airflow and the latest model. I need to update the picture in this review. ohh I see, I got one CFX in Amsterdam in july, with the old screen, didn’t know about this update, do you know if I can have this new screen from the manufacture? and if is possible to replace by myself? Since he didn’t answer I wanted to help out. 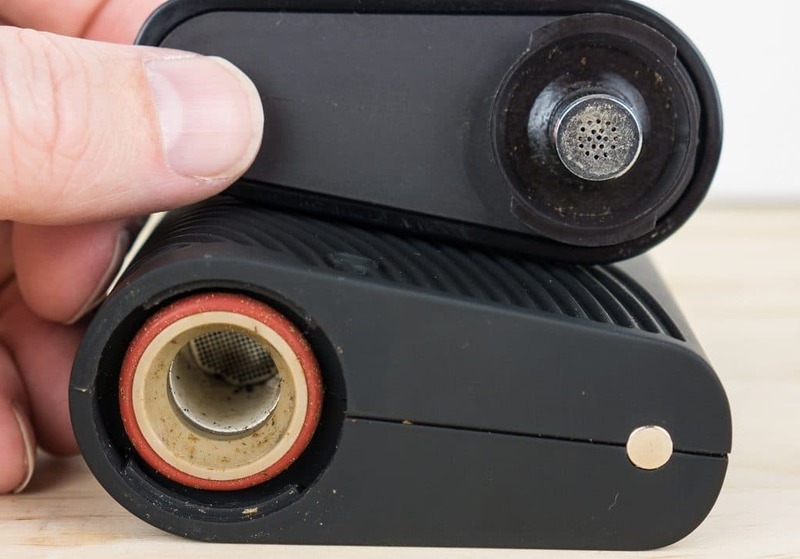 He stated above that you will get better air flow if you remove the mouthpiece screen chamber or whatever it’s called and replace it with a regular bowl screen or a dome screen you will get much better air flow. Unless you have something amazing to tell me about the new portable Vapir, I will be buying the CFX next. The Prima is pretty nice. More portable and works great with concentrates. But for the price, I think the CFX will work just fine. The full temp display and buttons on the vape make it super convenient to change temps and customize your sessions. Trying to figure out between this one and the PAX 2. I don’t think i’ll ever be taking it out of the house. What are your thoughts and comparisons? The Pax2 is definitely smaller, more portable, and more discreet, however none of that matters much if you are not leaving the house. If you are using it at home I think the CFX advantages will shine through, such as fully adjustable temps, more consistent vapor production and more even AVB and a cheaper price. The main advantage of the Pax2 will be the reliability/warranty since they are at the top of the class essentially in reliability and warranty length. The CFX is newish, but so far seems pretty darn solid, mine hasnt broken and I have not heard of many others with problems. I think you would be happy with either choice personally. 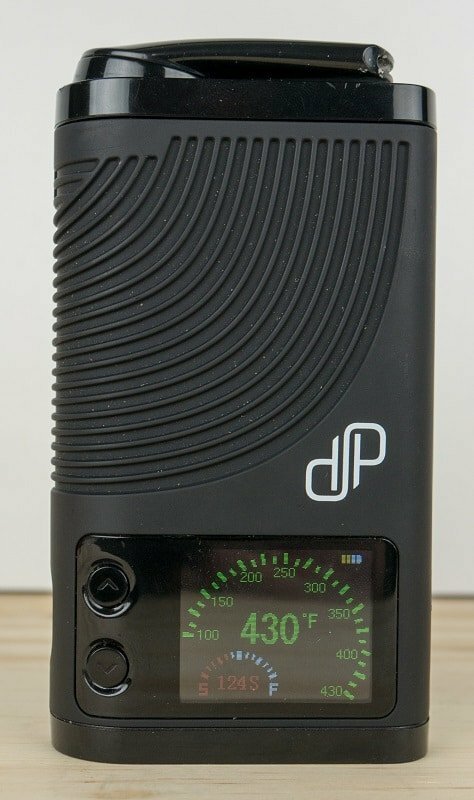 i’m searching for a portable vaporizer that supports herb and wax and producing big clouds like the cfx or even bigger ones? i tried the mighty and the cfx, i think the mighty tastes better but the vapor was to smooth for me (maybe wrong settings) compared to the cfx. the vaporizer will be a present for a friend who came from a bong smoking background, so it should produce some clouds that you can feel and see. As far as I know, the CFV is only for dry herbs. I don’t think it’s the best cloud producer either but I need to really test it some more. Would you be able to rate both the Mighty/Crafty vs the CFX/CF in terms of vapor quality? In terms of coolness, flavor, and clouds? I’d really like to get the CF but only if the vapor quality is almost as good as the S&B. I do want to hold out on when the Boundless Vapes all have user replaceable batteries, they mentioned that all models will have that ability sometime in 2017. I have the Arizer Air which is a super nice unit. Easy to clean and the vape is just really smooth and has really great flavor too but I’d like to add more Vapes to my arsenal. The first thing you will notice is there is a lot less draw resistance with the Crafty and Mighty compared to the CFX/CF. The vapor also tastes a bit better, and it’s definitely smoother/cooler as the cooling unit does a pretty great job. With the CFX/CF it looks like they have a similar cooling unit design, but in reality the vapor just go straight from the bowl to the mouthpiece straw, so there is much less time for the vapor to cool and smooth. So overall I do definitely prefer the Crafty/Mighty but they are also a lot more expensive, so it really comes down to your personal budget. As far as I’m concerned, the CFX has a stainless steel vape path according to a recent deconstruction, making it even safer. Can you change to celsius on the led screen with the cfx? Press the up and down buttons together. Hold it until it changes.